rec. National Philharmonic Hall, Vilnius, 1 Feb 2003 (Jeux; Partita); 27 June 2004 (Duo); Netherlanders Reform Church, Schiemonnikoog, 6 Oct 2004 (Monologues). Vilnius is the capital of Lithuania. It is also the birthplace of Jascha Heifetz one of the world's ikonic violinists. It is therefore fitting that the solo violin is at centre-stage for three of the four works on this disc. Barkauskas was born in Kaunas into a family sympathetic to music. He graduated first as a maths teacher and then took up music, qualifying in 1959. He continued his studies in Moscow and imbibed new and disturbing currents at the Warsaw Autumn Festivals 1964-1970 hence the clutch of Lutosławski-style titles. In 1964 at the age of 33 he wrote the cycle Poetry, the first Lithuanian serial composition. He has written six symphonies the last of which earned him the Lithuanian National Award, one opera and eight concertos. The mercurial Jeux for violin and orchestra is in seven panels with the longer three flanked and separated by the other shorter four. It was written for the 2002 Consonances Festival in Saint Nazaire. Joachim was the theme of the festival that year. The violin and its spectral, carnal and meditative aspects are brilliantly explored through a moving tableau of obsessive repetition, Waltonian petulance, barbed percussive figures and phantom landscapes. It's pretty magically done but Barkauskas's apparatus is of the avant-garde even if mediated through a softening amalgam of Bach (the partitas and sonatas) and Walton. The writing is lean and clean. 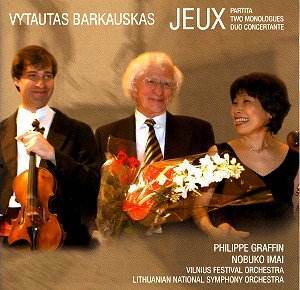 The Jeux was written for and dedicated to Graffin and it is Graffin who plays Barkauskas's Partita for solo violin. The Partita has been recorded many times and has carried the composer's name across the world. Its style owes something to Bach and a lot more to nationalistic models and popular dances such as the beguine and rumba. Once again the orientation is second Viennese school starting with Berg. Graffin does not disappoint in this darkly brilliant piece. Nobuko Imai is the other famous 'anchor' for this CD. She plays the two unaccompanied Monologues; both rather severe monochrome by comparison with the Partita. She plays them with adroit dedication but these are works that have very little surface glamour. The four movement Duo Concertante returns us to buzzing activity and the full orchestra. The two soloists play chase and exchange games with phrases intoxicatingly swapped between the two. It was commissioned and premiered by conductor Robertas Severnikas and is dedicated to the Japanese diplomat Chuiune Sugihara and his wife Yukiko. Sugihara was in Lithuania during 1940. Schindler-like he saved some 10,000 Lithuanians from death at the hands of the Nazis by granting them visas to Japan. Barkauskas wanted to catch some flavour of Gallic exuberance and of Japan. In this he is successful. The Japanese element is unmistakable in the second movement and the Gallic in the first and third - heck it's almost Poulenc at times; Ravel at others. The soloists are called on for the utmost virtuosity with surging coordination, furious motion - not so much a Lark Ascending but a Lark on rocket fuel. The intoxicating bravura of the two instruments recalls Arthur Benjamin's Romantic Fantasy (violin, viola and orchestra) filtered through the bitter lyricism of Wilfred Josephs� music for The Great War and Thomas Wilson's incidental music for Cloud Howe. With these titles you might instantly reach for the identikit and assume a recital of Lutosławski lookalikes. Well not quite. Barkauskas is not a soft-focus nationalist. He is an architect of fragile textures and constant motion but he has struck an accommodation with avant-garde effects. Through the clicks and clunks, chimes and occasional squeals a singing soul is at work - and sometimes he can be a very gentle soul as in as the fourth movement of the Duo. These notably well-balanced textures sometimes recall the seething activity of Shostakovich's last symphony but without the allusions to other works from the classical greats. While Jeux just ends unresolved the rush of the finale (movement V) of the Duo Concertante is viscerally exciting, nervy with bongos, rapped out by the brass and finally consigned to silence by a roared Eventyr shout from the men of the orchestra as the two soloists gambol together into the final strait. No wonder the audience whoop - it's an exhilarating end to a fantastic piece not without angularities. and with a reminiscence of Prokofiev�s Romeo and Juliet.